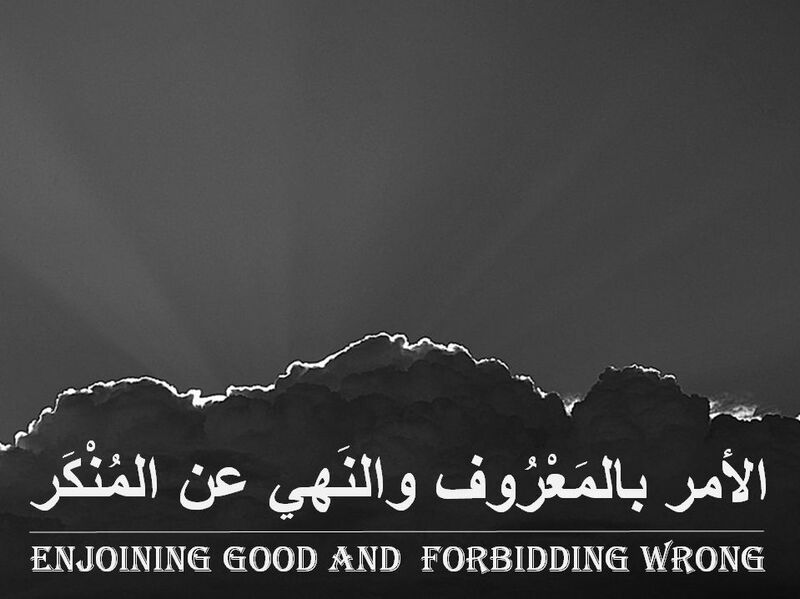 Enjoining Good and Forbidding Wrong ~ Islam My Ultimate Decision . All religions propagate peace, love, enjoining good and forbidding wrong. 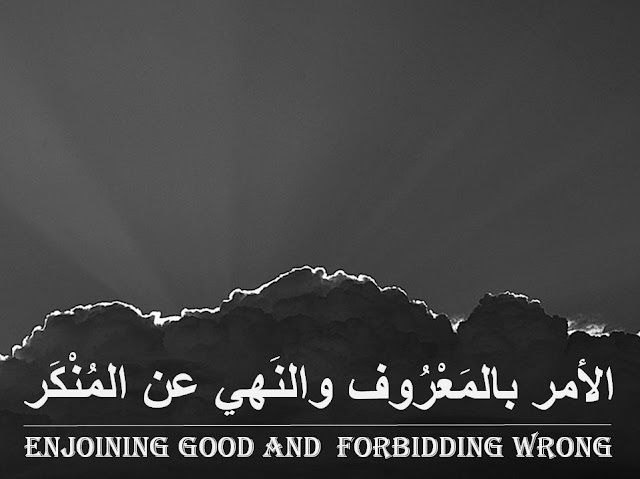 But in Islam, it is more than that mere pursuing good or forbidding bad. In fact it is incumbent upon every Muslim to enjoin good and make his/her utmost to prevent wrong. "You enjoin what is right and forbid what is reprehensible"
That is to say that in the first place every Muslim should strive his/her best to do do good and resist from doing what is forbidden by Allah. If every Muslim sticks to good deeds, it will have tranquil effect in the society and others will be attracted towards doing good too, as there will be nothing bad to be seen around them. Doing good may not raise any eyebrows as it is something that one is doing himself and those not doing good may not be affected by such deeds, if they have no fear of Allah left in them. However, in some conditions, even a righteous person or a person who always enjoins good may pose a difficult situation for those doing otherwise. It is often seen that hardworking employees are seldom liked by dodgers and those shirking their duties to evade handwork and enjoy life as it comes to them without someone comparing them with the good employees. Even under such trying conditions, one must continue to do good no matter what - that is the minimum. Thus a Muslim must himself be good and encourage others to do good, either through setting personal example or by words of mouth - in Islam this duty is called "Amr bil Ma'roof", which means enjoining the right. The Arabic word Amr means instruct or urge (someone) to do something or to enjoin, while Ma'roof means ‘good, known, well-known, generally recognized, beneficence, approved by Shariah”. So Amr bil Ma’roof means ‘Enjoining the good, the approved” or "ordering for acknowledged virtues". 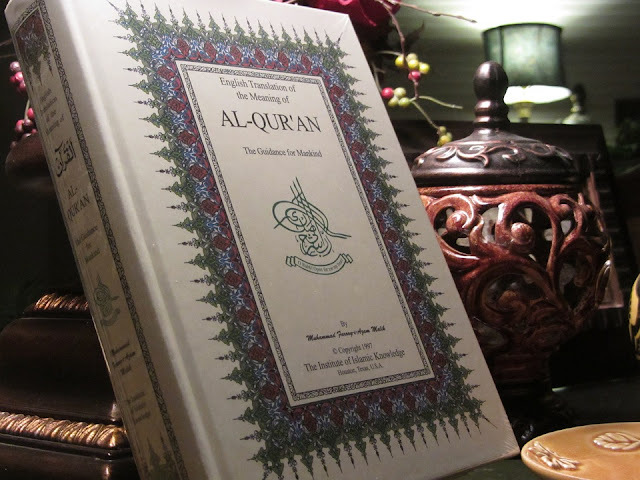 At the same time, a Muslim must also refrain from violating the laws enunciated in the Holy Qur'an, and the laws of the land and of the state. Besides, he must also refrain from committing sins or acts which have been forbidden by Allah and as explained in the Holy Qur'an and elaborated by the Prophet Muhammad. It will only be then he will be justified to to prevent sins and corruption from the society he lives in. Islam calls this duty "Nahi ‘anil Munkar", which means forbidding the wrong. Munkar, which is the opposite of Ma’roof, which means ‘bad, evil, detestable, disagreeable, abominable, disapproved’. Thus Nahi ‘anil Munkar means ‘Forbidding evil, wrong, the disapproved’. Thus Amr bil Ma'roof and wa Nahi ‘anil Munkar together form one of the most important and foremost duties of every Muslim. It is in fact the rai·son d’être of the Muslim Ummah. But the problem arises when it comes to stopping someone who is doing bad things are following a wrong path. Here as A Muslim, we have have an obligation: To stop wrong being done or forbid its happening. This is something which is very difficult thing to do but as I said before it is the obligation which has been thrust upon us by the Almighty Allah. If he is powerful and have guts to stand before a demagogue, he must stop the wrong be done forcibly. However, he must be perfectly sure that that what he is stopping is really wrong as sometimes apparent wrong may not be so in reality. And if does not find him powerful enough to physically stop someone from doing wrong, he may forbid the wrong doer by tongue. This can be forceful command if one can muster enough courage or even a persuasive tone to convince the wrong doer that he is doing a wrong thing which may not only harm him, but may have a collateral effect in the society as well. And the least one can do is that one must detest the act of wrong doing from his heart, which though is considered to be the sign of the weakest faith. The Holy Prophet Muhammad (ﷺ) has quoted to have said by Abu Sa'd al Khudri (Sahih Muslim, Hadith 79): "He who among you sees something abominable should modify it with the help of his hand; and if he has not strength enough to do that, then he should do it with his tongue; and if he has not strength enough to do even that, then he should (at least abhor it) from his heart; and that is the least of faith."